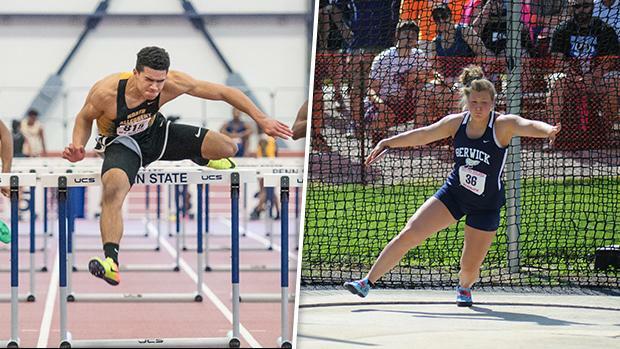 Berwick's Payden Montana and North Allegheny's Ayden Owens have been named 2018 Gatorade Pennsylvania Track & Field Athletes of the Year. Gatorade announced the recipients of the honor earlier this week. Montana had a record-setting senior season. The Penn State recruit won the PTFCA indoor state title in the shot put. In the spring, Montana went undefeated in the shot. She won the event at the Penn Relays and then followed that up with her second straight AAA shot put state title. At the state meet, Montana set all-time Pennsylvania state record with a throw of 51 feet even. She capped off the year with a shot put national title at New Balance Nationals Outdoor in Greensboro, North Carolina. She was the only girl in the country to throw over 50 feet during the outdoor season (and she did that in three different meets). She also had a big year in the discus, winning the AAA state title. Her season best in the disc was 164-11. Owens, a USC signee, has also had a big senior season. The versatile multis-specialist shined in both the hurdles and long jump this spring. After a winter that included a national title and state record in the 60-meter hurdles (7.59), Owens carried that momentum in the spring. For the second straight season, Owens won PIAA Class AAA state titles in the 110-meter hurdles (13.69) and the 300-meter hurdles (36.68). Both of those times were just off his season bests of 13.68 in the 110s and 36.65 in the 300s. He also jumped a best of 24-00.5 in the long jump and leapt 23-03.25 to take second at states. He added a 110-meter hurdles win at the Brooks PR Invitational in 13.80. Both Montana and Owens join an elite list of Pennsylvanians to win the Gatorade Athlete of the Year award. Last year, Madison Wiltrout and Jordan Geist won the award.